A conversation with an employer about your disability involves several decisions. Are you required to tell an employer about your disability? No. Disclosure of a disability is not required. Job candidates should be aware that once disclosure of a disability or an accommodation request is made, employers may ask the employee about the limitations related to the job and are permitted to make medical inquiries. When is the best time to disclose a disability? If you have a visible disability, you may want to anticipate the concerns of the employer. Consider taking charge during the first interview to talk about your disability and how you would handle any impact on the job. You may want to describe any accommodation you use, how it helps your performance, or demonstrate how you would perform difficult functions. Many experts suggest disclosing before a job offer in order to communicate self-confidence and refocus the employer’s attention on your ability to do the job. Some people with non-visible disabilities may choose not to disclose their disability at all. Let the interviewer know that you would be glad to answer any questions they might have about how you would do your work and the accommodations you use. 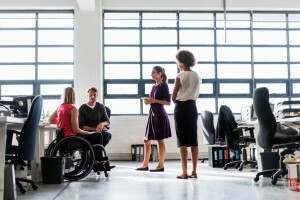 Being open and direct about your disability will help put the interviewer at ease, which is a critical factor in whether you receive a call for a second interview. Get more ideas on disclosing a disability from the Job Accommodation Network, or see PACER’s workbook on disability disclosure, written for youth but an excellent resource for all ages. And find more resources and information to help support your successful employment at CareerOneStop’s Resources for Workers with Disabilities. ‹ Can I get a moo? Celebrating Ag Day!